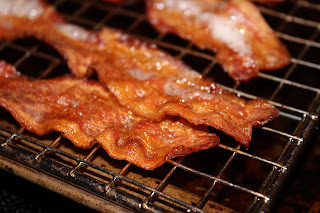 I may be a vegetarian, but (according to my husband, who has a totally unbiased opinion) I make the best bacon. The best way to make perfect, crispy bacon? Bakin'! 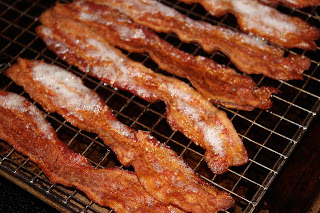 I first learned of this trick many years ago from my sister who always baked her bacon. 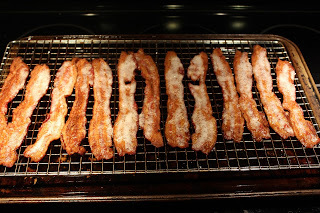 I always hated making bacon on the stovetop because of the huge mess it created. No matter how careful I tried to be, grease would splatter everywhere, including on me. By baking it, there is little mess and, the little mess it does create, is contained into the oven. I also like to bake mine on a metal cooling rack. 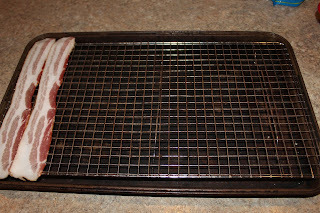 This way the bacon is not sitting in a bunch of grease and, it allows air flow all around the strips of bacon helping in the crispiness. Jason likes his bacon super crispy, if you prefer yours a little less done, then just reduce the time it bakes by 5 minutes or so. Also, it's ok if you need to crowd the baking rack. As the bacon cooks, it will shrink and you can separate the slices as you go. If you start with a crowded pan, the cooking time may take slightly longer. 1. Preheat oven to 375 degrees. Place a metal cooling rack over a cookie sheet* and place bacon slices one by one onto the rack. Again, it's okay if they have to overlap. 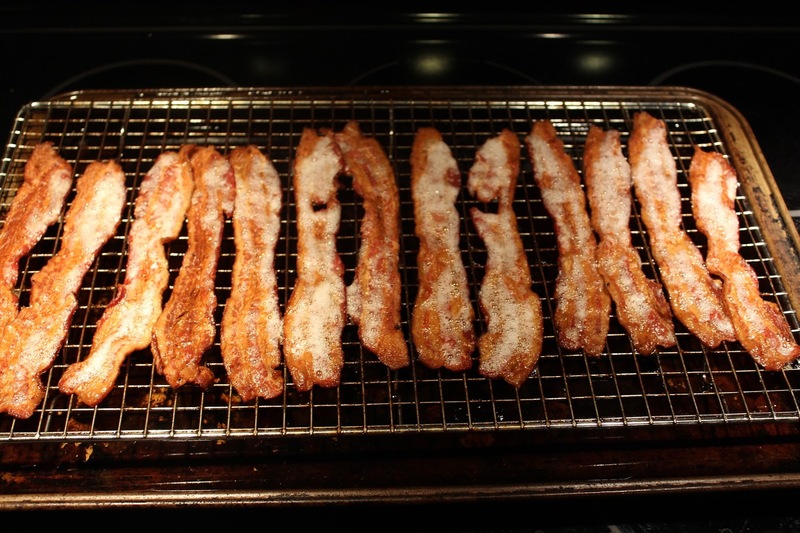 Place the tray of bacon on the lowest rack inside your oven. 2. 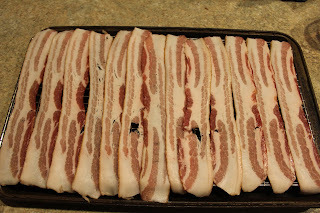 After 20 minutes, remove bacon and flip, separating any slices that were stuck together. If you have a lot of grease, drain** that before returning the pan to the oven. Place pan back in the oven and back for an additional 10 minutes or until desired doneness. 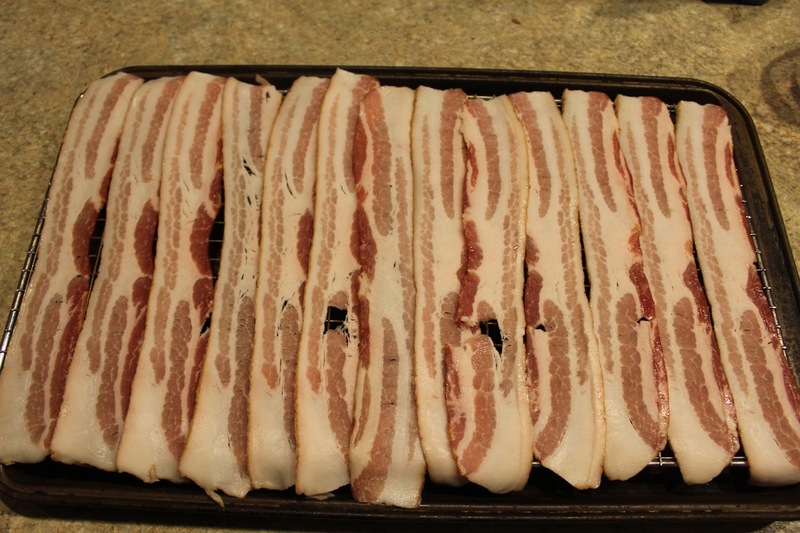 Carefully remove bacon and place on a towel-lined plate and blot away any standing grease. Enjoy! *You can cover your cookie sheet with foil to help reduce the mess on your pan. I used to do this, but now I just have one cookie sheet and one rack that are specifically designated for bacon (and the occasional meatloaf). **To drain the grease, I like to line a large bowl with foil and pour the grease into the bowl. Once the grease has hardened, gently remove the foil from the bowl and throw away. Easy cleanup! We bake our bacon over here, too. Although, I don't have one of those baking racks. I usually drain the grease a couple times while it bakes. I'll be getting one of those racks for sure!